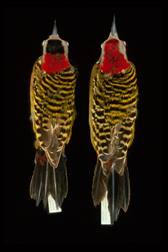 The MVZ bird collection is one of the largest in the United States. It houses over 185,000 catalogued specimens, including 174 holotypes and 2 syntypes. The majority of specimens are study skins, but the collection also contains over 21,000 skeletal specimens and 3,200 fluid-preserved specimens. Other types of preparations include flat specimens (wings, skins) and body skins with skeletons ("schmoos"). Tissues, anatomical parts (e.g., syrinx, stomach contents), and parasites are routinely preserved with specimens. Many species also are associated with audio recordings. MVZ bird specimens date back to 1836, and the collection has continued to grow steadily since its inception in 1908. The collection is taxonomically synoptic, with representatives of every Recent order of birds. For most orders there is at least 70% representation at the generic level. Although the collection contains specimens from every continent and major ocean in the world, geographic strengths are western North America from Alaska and British Columbia through southern Mexico. In addition, there are major series of specimens from Central America (especially El Salvador and Costa Rica), South America (in particular, Colombia, Peru, Paraguay, and Argentina), the Hawaiian Islands, the South Pacific, and Australia. Uses of the MVZ bird collection have changed over the years with advances in research methodologies. Although traditional studies of morphology, geographic variation, and molt continue to make use of the skin collections, more recent uses have focused on destructive sampling of skins for biochemical (e.g., DNA), stable isotope, and contaminant analyses. Requests for such sampling are reviewed carefully and critically by MVZ Curators. Primary uses of the skeletal collections are for comparative study of zooarchaeological or paleontological material, while the anatomical collections are used for systematic, morphologic, and parasitological studies.